In this award the judges were looking for evidence of an innovative and effective report that plays an integral part in the communication of the strategy and investment case. An annual report should provide insight into the company’s main objectives and strategies, the principal risks it faces and how they might affect future prospects. 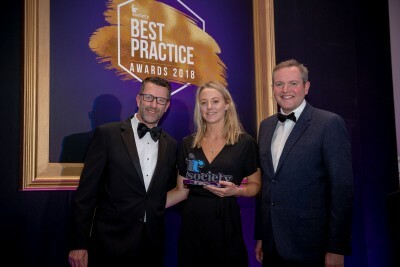 Congratulations to Swiss Re who are commended for doing a great job of making their story clear and understandable, and really drawing the reader in. The judges particularly liked the way the annual report described the investment proposition and the purpose, focus and resilience of the business. Well done Swiss Re! (From left to right) Jack Aldane from IR Magazine, Alexa Winnik from Swiss Re, Bill Krarup from MerchantCantos and Miles Jupp. In a hotly contested category, the judges would like to highly commend Puma Energy for an engaging report, prominent use of facts and figures, and good link to KPIs. 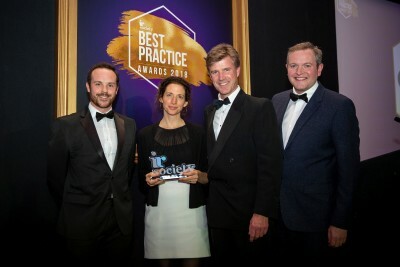 Congratulations to Majestic Wine for an excellent example of a small cap delivering best practice. The judges applauded the clear and innovative design of the report, as well as a brilliant use of customer stories. This is a report that ‘breaks the mould’— a very intelligent presentation with an excellent tone of voice. Well done! 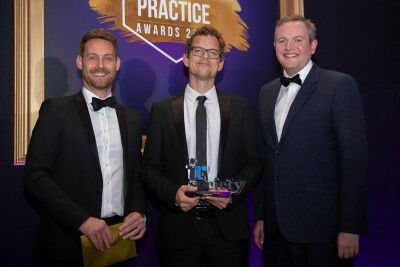 (From left to right) Joel Garthwaite from Invicomm, Andy Meades from Friend Studio (on behalf of Majestic Wine) and Miles Jupp. Congratulations to Derwent London who produced a well-designed annual report with very clear sub-division of elements which also worked nicely online. The judges also liked the very well explained risks to the business. Well done Derwent! (From left to right) James Houston from Jones & Palmer, Quentin Freeman from Derwent London, Darren Waller from MerchantCantos and Miles Jupp. Congratulations to Taylor Wimpey, the outstanding entry in this category. The annual report had an excellent layout with good links between KPIs, strategy and remuneration. 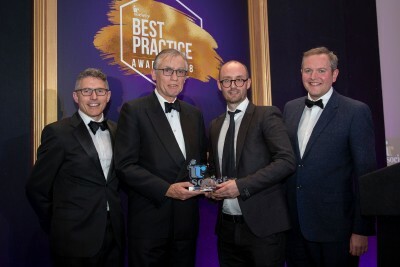 Rich in content, the judges remarked that it was a ‘refreshingly honest view of a challenging sector.’ Well done Taylor Wimpey! (From left to right) Rob Hemming from Equiniti, Alice Thomas from Taylor Wimpey, and Miles Jupp.